**My Desert Cottage**: A nest, a bird and a very happy girl! A nest, a bird and a very happy girl! I have to share with you one of the most lovely handmade gifts I have ever received! It came from my friend Vicki from 2 Bags Full. Vicki is one of the sweetest women I know, and she is also a very talented fiber artist. She makes the most gorgeous nests from wonderful yarns and fibers. 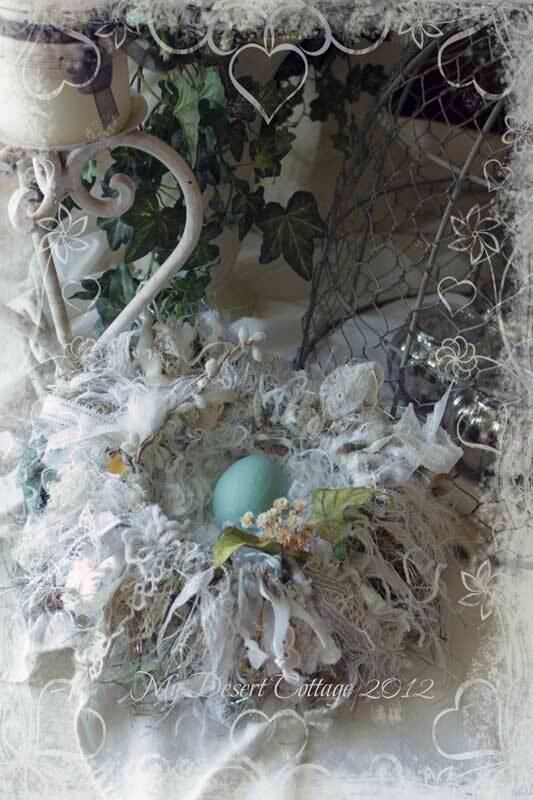 I have always coveted those beautiful nests she makes and wanted one in whites so it would match my house. Well, sweet Vicki sent me one! I squeeled with delight when the package arrived!!! Thank you Vicki! I will treasure it always. And while we are on the subjects of bird-y things.... I thought I would share this photo I took this weekend. In my neighborhood, we have a whole flock of peach faced love birds that live here. I hear them all the time because they are very vocal, but rarely do they hang out long enough for me to enjoy their beauty. This one hung out in our backyard Sunday, for almost a half hour, just wandering around and checking things out. He even paused for a photo op!!! I thoroughly enjoyed this as most of the birds around here are brown and not pretty and colorful at all. Yes, I know... I'm easily amused!!!! Have a wonderful week my friends. I'll see you Thursday after I visit Sweet Salvage, AGAIN!! LOL! You are one very lucky girl to get one of those beautiful nests! I love the picture of that colorful bird. It always excites me when I get to see a colorful bird in our back yard. You have been twice blessed this week. I love the bird theme and your little visiting bird is adorable. Love the nest..so unusual..lovely..I have the brown love birds..Enjoy your week..Wish there was a "Sweet Salvage" around here to visit..
Vicki did a great job on your nest with the whites, Karen! I ordered one from her a couple of years ago and I still love looking at it. Wow, had no idea love birds were native to Arizona! I have a pair of nesting Orioles. They are so beautiful with their bright orange, yellow and black plumage. What a blessing to receive such a beautiful gift! Love the nest you got from Vicki! She is the Bestest, Ever! She surprised me with one several years ago when I met her, in greens! I LOVE it! It sits on a place of honor on my Mantle. I am having a GIVEAWAY over on my blog,,,,,Can you believe it, it is "Bungalow Bling's 3 year "Blogaversary! Stop on over and say Hi and Enter if you'd like a Vintage Goodness Crown with a bunch of Goodies! Hugs, Love and a BUS! Oh! Forgot, I LOVE the Birds, How gorgeous! I have fantastic Hummingbirds in Bright Green and Coral,,,,,but they move too fast for this girl to take a Photo! Wow, Karen, and birds nest and a bird all in one day! Usually we get on without the other....your new next is just abolutely amazing and I can see why you have wanted one all this time! Of course, the Peachface is very unique because they are not native to Arizona. What a treat! I came here to tell you that I just gave you a shout out on my recent blog post -- and was totally surprised to see my little nest pictured here -- you silly girl -- thank you for sharing it with everyone. It looks totally beautiful in your home -- just like I knew it would! The fabric nest is awesome Karen, no wonder you wanted one. What a lovely post! Oh, I would have have been overjoyed too with such a lovely gift! 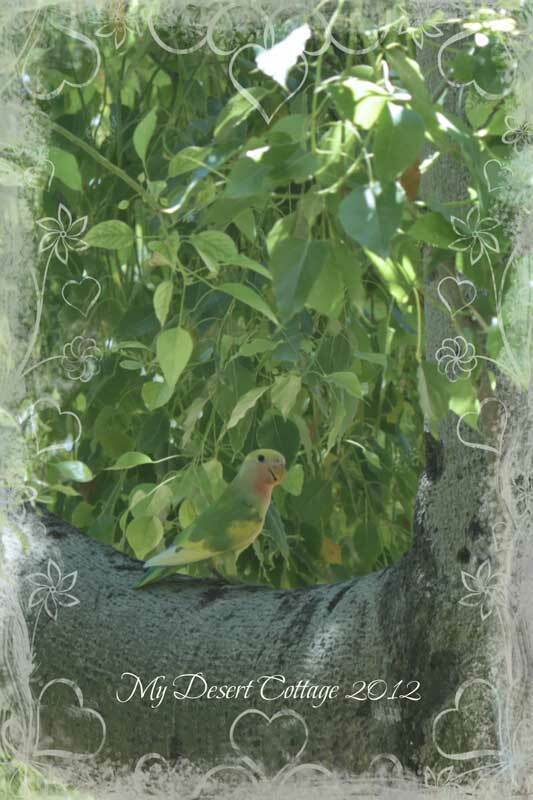 You did such a neat picture of the lovebird> How do you get the litle lacy edging around the picture? Wow. That nest is beautiful. The little birdie photo is pretty cute, too! Lucky you! I love that nest. I went to her Etsy shop but she didn't have any small nests for sale. I wonder what she sells them for? It is so pretty--so much texture! I have never seen anything like that. Okay so "she" is swooning over the beautiful nest. Me? Not so much, the egg hasn't hatched yet and the nest itself is much too small for me. No, I'm not fat, it's just a small nest. I have admired those fabulous nests so much. How lucky you are to own one,I love the shades of white. That little bird must have heard the news and popped round to view this 'des res'. That nest is gorgeous, Karen! No wonder that you are such a happy girl. The love bird is a cutie. How wonderful that you have those around. What a Lovely Gift... it is Beautiful! I love Vicki's nest and I have just ordered one just like yours which I will received at the end of this year and I can't already wait for it to be here! You are so lucky!! Hope all is well. Hi Karen! That bird nest is amazing! And I can't believe those parrots are just.... out! Pretty cool! There are wild macaws in San Diego that are the most beautiful blue. They catch you off guard because they look like they belong in the rain forest. Neat to see. Beautiful nest! And the Lovebird is too cute! Looks a little like my daughter's lovebird; but hers is grey and white. Lucky you! Hi Karen, I'm so glad you are enjoying your summer...hot hot hot! I love the lovely birds nest, in white, exquisite! LOVE your nest. Sandy gave me one for Christmas one (a sea shore nest) year but, I don't know if it is made by the same person as yours. It is really pretty & I hope you enjoy yours as much as I do mine. AND THAT BIRD... wow what amazing colors. You are such a great photographer! Talk to ya soon. I wonder if they are the same love birds from my side of town. We had a neighbor raising them and they moved and let the birds go. I haven't seen them in a year, they used to eat our sunflower seeds. Your nest is beautiful and of course it fits in perfectly with your house decor. My husband bought me a drawing pad for my computer, but I haven't used it yet as I'm still a little shaky from my recent stuff. I hope we can get together when it's cooler. I cannot believe that love bird photo. It is beautiful against the green leaves on a tree. This should win a prize. Thanks for sharing. Oh, what wonderful delights!! That nest is gorgeous! She must have part bird in her. LOL! You are SO fortunate to have Love Birds in your backyard!! I adore birds and get quite thrilled when I catch a photo of them, especially the illusive ones! Last year I was on vacation with my husband and we were passing by a huge field that had curious white sections. I wondered out loud what kind of plant or veggies were growing there. As we got closer I discovered to my extreme delight that they were an enormous flock of Snow Geese!! I took a ton of photos and was able to experience their honking and the sound of hundreds of wings flapping! It was our first day of our vacation and was so satisfied with this huge gift that God gave us that I could have gone home right then and there and been satisfied that I had the best vacation! LOL! Thankfully that wasn't the end and we went on to have a joyous time celebrating our anniversary. What a gift! I thought you would enjoy that story, being a bird-lover too. Anyone need a new party dress?? ?